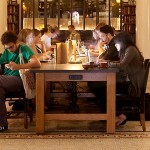 Getting my morning dose of social media, I came across an article on Fast Company.com about an intriguing hotel concept. “Creatives gravitate to a showy New York hotel lobby [The Ace Hotel] to work hard and look good doing so,” according to the article’s author, Lizzy Goodman in \”Ace Hotel\’s Communal Workspace Shows A Winning Hand\” I highly recommend reading about this very creative — and successful — concept. But this isn’t a blog about the Ace Hotel. This blog was inspired by a quote in the article. I’m always struck by brilliant examples of well-delivered messages, odd sentence constructions or examples of spokespersons trying too hard. “The environment here is more or less a spontaneous organism striving for homeostasis,” said one of the hotel’s co-founders. This quote certainly makes you stop and think. But rather than ponder what the spokesperson meant, I immediately formed an impression of the spokesperson as trying too hard to be erudite. The article’s author wrote about the experience in a way I found more immediately descriptive, “For a class of designers, academics, stylists, advertising execs, writers and entrepreneurs,” (the reader can now visualize who’s sitting in the hotel lobby), “the Ace Hotel lobby is their collective workspace….The Ace is a model of the modern workplace in a borderless world.” Got it! And more…I love it! Please forgive one tangent…Reading about the Ace Hotel lobby reminded me of the late 1970’s when I met with publishing friends and an occasional author in the lobby of the Algonquin Hotel. I never quite felt like an insider in this amazing lobby frequented by literary and theatrical legends, but relished every moment soaking up the ambiance. The lobby — even more than the hotel rooms — was a population destination. This entry was posted on Friday, August 12th, 2011 at 3:26 pm and is filed under Communication Skill, Observations. You can follow any responses to this entry through the RSS 2.0 feed. You can leave a response, or trackback from your own site.